One solution for your top IT priorities. vSpace Client for Windows allows you to lower costs while adding new capabilities such as remote, mobile, and legacy PC access to NComputing vSpace deployments. Extend the value of our easy to use, but incredibly powerful vSpace Server desktop virtualization software to any Windows PC, laptop or netbook. Re-purpose Old PCs - Leverage existing hardware investments by re-purposing out-of-date Windows OS devices to access virtual desktops. Enable BYOD - Support a "bring your own device" computing model. Simple Upgrades - Avoid costly and time consuming individual PC hardware and software upgrades. Priced Right - With a usage based licensing model. 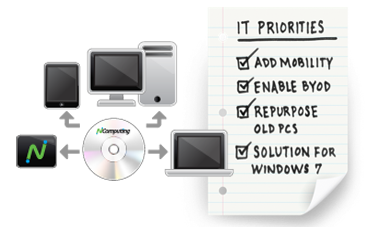 Build As You Grow - Get desktop virtualization benefits incrementally.